Crunch time of the year for teaching, so the games dried up. 4 weeks and the total game time is nowhere near my average weekely total :(. Sengoku (15h) - Picked up Friday night on sale. Looks like a Japanese Crusader Kings, which is perfect to lose myself into for de-stressing. Played a couple of games and it seems a little easier than even Crusader Kings. Terraria (10h) - Mainly in the weekend after finishing up. Cam's go-to game still. CivWorld (5h) - Last part of the CivWorld game before shutting up shop. Ended up winning the game and making the 1000 point mark to get the top unlockable achievement. Grepolis (2h) - Put myself into vacation mode to survive crunch month. This is a card game developed to test a high level game mechanic for the upcoming Notorious computer game. First play-through seemed to generate the desired reaction from players with many strategies in play, so it was good enough to be released in its own right. A game is divided into 5 rounds, after which all but the top player’s points are counted toward your final score. Each round you may play a card either in front of you to increase your game score, or in front of another player to increase their score. Cards may be either face up or face down, however any card played face up generates a bonus point for the player that it is in front of for each round that the face up card is in play . These bonus points are counted no matter who has the top score for the game. Cards: 1 card deck is sufficient for up to 7 players, 2 card decks can be combined if more players wish to play. Space: Typical arrangement would be players sitting around a table. A dinner setting space per player is sufficient. A playmat is available to help organise card placement, but isn't mandatory. 1. A match is divided into 5 games, where each game consists of 5 rounds of play. 3. Nominate a starting lead-off player (or randomly choose using a card draw). 2. The lead-off player shuffles and deals 7 cards to each player. 4. The the lead-off player may play one card either in front of them or in front of any other player. The card may also be played either face up or face down. 5. Play continues clockwise for each player to play their single card per round (either in front of them or in front of another, either face up or face down). 6. Once all 5 rounds are complete, count up bonus points and game score (see scoring). 7. Highest game score is reduced to 0 and they are the lead-off player for the next game. 8. Winner is the person with the highest aggregate final score after 5 rounds. 1. After the 5th round has finished, count up any bonus points first by tallying how many rounds each face up card has been in front of you and add them to your match total. Eg: A card playing face up in the 1st round will have been in 5 rounds, so scores 5 bonus points, whereas a card played in the 4th round will have only been in 2 rounds, scoring 2 points. As a total, having a face up card played in front of you on rounds 1,2 and 4 would gain 5,4 and 2 points respectively, tallying to a total of 11 bonus points for the round. 2. Flip over any face down cards and tally up the total face value of cards in front of you. Picture cards count as 10 and aces count as 1. 3. If you have the highest points for the round, you are disqualified and score 0 points. Everyone else adds their points to their match total. 4. If there is a tie for the highest points in the round, both players involved in the tie can place an additional card onto their opponent’s score as a tie breaker. If it still remains a tie, play your final card onto your opponent. If there still remains a tie, continue to draw cards from the undealt pack and place on your opponent’s score until there is an eventual winner. This additional score is also counted in the match total for the eventual 2nd place getter. 5. Calculate and announce your new match point totals while the new game is being dealt. 4. The winner is the aggregate match point leader after 5 rounds. 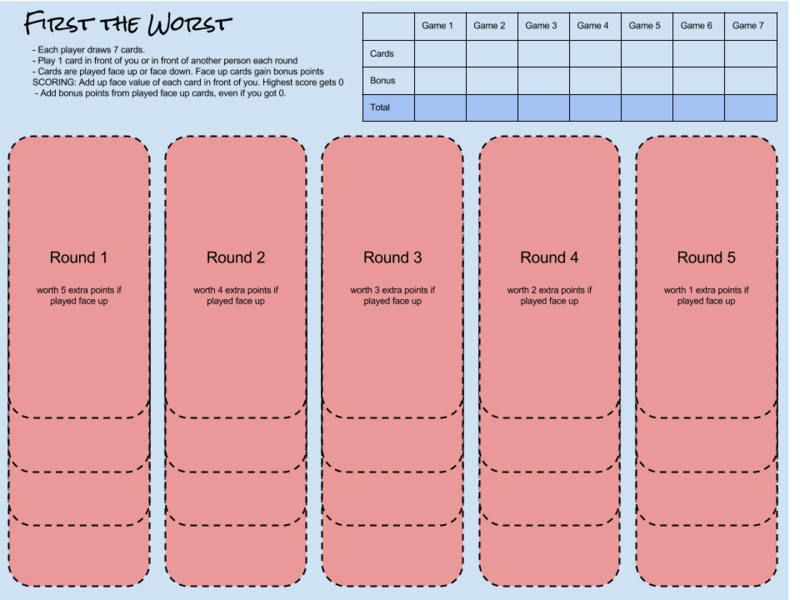 Play Mat: To aid tracking of bonus points, you may wish to create a play mat by drawing 5 boxes in order on a piece of paper and labelling them from 1 to 5 for each round. Play your cards into the box for that round, even if it is on someone else’s mat. Make sure that each face-up card’s value remains visible, and that the number of face down cards is known.